M6 hold-ups. Photo Highways England. 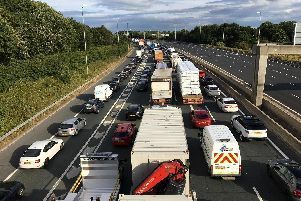 Long queues built up on the M6 northbound near Preston around lunchtime today after several vehicles were involved in a collision. The smash happened near to junction 31 (the Tickled Trout turnoff) and caused tailbacks as far down the motorway as junction 28 at Leyland. Emergency services managed to move the vehicles off the carriageway and onto the hard shoulder. But residual delays were taking time to clear. It is not know at this stage if anyone was injured.